Watch a San Diego Zoo cam for your favorite animal - panda, tiger, elephant and more. Bring the zoo into your home with a live web cam. Is your busy schedule keeping you from gathering all the kids up and going to the zoo? There are so many exciting things constantly changing at the San Diego Zoo that you are missing out on because you can’t be there seven days a week to see it all. Now is your chance to be a fly on their wall and see what those crazy animals are doing when they don't think anyone is looking. No, seriously, you really do have the opportunity now to watch several of the San Diego Zoo animals, via live webcams, courtesy of the San Diego Zoo. Copyright San Diego Zoo. Photo by Ken Bohn, San Diego Zoo. Giant Panda Cub. One of the popular San Diego Zoo cams is the Panda Cam. San Diego Zoo is famous for these adorable bears. Take a fun break from your day and see what they are up to. Now truly is your chance to bring the life of a zookeeper straight into your house. Via San Diego Zoo’s wonderful webcam set-ups, anyone can view the intricate happenings of cute critters and their daily activities while enjoying a cup of coffee at home, or taking a break at work, or even sitting with your kids in the evenings. Log into San Diego Zoo web cam site at sandiegozoo.org and start with any one of their webcams to instantly begin viewing live feed of the animal of your choice. It doesn’t matter which web cam you start with as each individual animal can show you and your family a little something about them that only hidden cameras see behind the scenes and after hours. So take this opportunity to learn as a family about how much koalas need to sleep in order to digest their constant intake of eucalyptus leaves, or how much a baby orangutan needs to watch her mother’s every move so that she may one day be able to function as an independent adult, or even sneak a peek at the graceful movements of polar bears as they dip in the pool for a swim to cool off. What are you waiting for? Log in now and see what is happening! 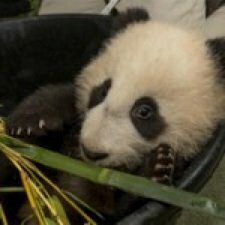 My favorite is the San Diego Zoo panda cam, but it's fun to check them all out. Animals are like humans - they may be asleep or out of the camera's view, so if not much is happening on one zoo cam - come back later or try another one.